Just reading that makes my mouth water! Mmmmm, mmmmmm goooooood! Good morning. . .well. . .it’s a good morning because I’m above ground. That’s the best I’ve got. Those? Those are Banana Pudding Cupcakes. You can help yourself. Instead of me telling you about how my heart has been broken because I caught my live-in boyfriend cheating on me with the hostess of the restaurant where he’s the head chef and I’m the head pastry chef, I’ll tell you about how I came up with the recipe for the Banana Pudding Cupcakes. Every restaurant in the south pretty much has banana pudding on their menu. As a kid, I liked the taste, but there was just too much of the pudding. My parents had taken me to one of those smorgasbords type restaurants. I remember taking a cupcake and a plate of banana pudding from dessert section. I wasn’t sure which one I wanted to eat and Bitsy, that’s my mama and how she likes for me to refer to her, was beside herself that I’d taken two desserts when people on the other side of the world just wanted one dessert. She was good then about making me feel guilty. Anyways, I did my teenage job of ignoring her and scrapped the icing off the cupcake. I scooped some of the banana pudding, with a piece of banana, and frosted the top of the vanilla cupcake with it. My dad watched from across the table with a look of disgust on his face. Of course I had to try it and no matter how bad it was, I had to pretend it was good. I’d taken a deep breath and bit into my creation. It was an experience I’d never had. I guess the look on my face spoke so loud to my dad that he reached over with his fork and upon my agreeable nod, took a bite. The next day, there was a twenty dollar bill and a note from my dad that said to head to the grocery store and buy the ingredients I needed to create a real banana pudding cupcake. That was, as we say in the south, all she wrote. It happens to be one of the most popular desserts I make at The Manhattan, the restaurant where I work in New York. You know, the one I was referring to when my live-in…moving on! Anyways, I took a couple of weeks vacation and found myself back in Rumford, in my parents home, in my old childhood bedroom. Ugh. Not where I plan to be for too long. But if Bitsy has anything to do with you, she wants me to move back for good. No way! Anyways, I’m beyond excited to hear what a dessert you love to eat. Tell me to be entered to win a Tonya Kappes tote bag along with It's A Southern Mystery, Y'all measuring spoon and jar opener along with lots of cozy mystery swag and Tonya Kappes print book! Grab the Banana Pudding Cupcake by clicking here! See why readers are loving Batter Off Dead and why Woman's Magazine made Batter Off Dead their book club of Christmas! 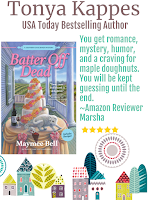 "Romance, a lovable bunch of eccentrics, and a collection of recipes with murder most foul." Shut the front door, a banana pudding cupcake! What heaven that must be! I do hope I have the ingredients for these so I do not need to send someone out in the snow to go to the grocery! Well, besides banana pudding, I do love carrot cake! I also make carrot cake cupcakes! Thank you so much for the generous giveaway! 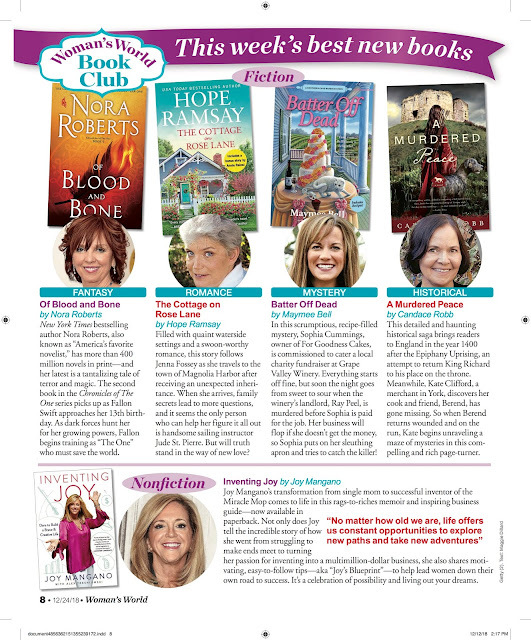 I do love your books! I could try this with GF flour. It would be delicious. I am still searching for the great GF dessert. For now, I like ice cream - moose tracks. I love strawberry pie and chocolate lava cake. Those are my two favorites. mcastor07 (at) gmail (dot) com. This sounds wonderful. It's hard to pick just one. But I love Dutch apple pie or NY style cheesecake. I pretty much love any dessert but especially when chocolate us involved !! I have to be careful with desserts. I am diabetic but I adore banana pudding. I bet this is delicious.it sounds amazing. I'm reading it right now! Love it! Love it! I wish Sophia's bakery was right across the street from me!! I would love to have the cherry flip flops! Favorite dessert....hmmmmmm i'm going to have to go with Apple Pie. I loving this series! These cupcakes sound so yummy. My favorite dessert is my momma's chocolate sheet cake. Thank you for the chance. Today I'm making bourbon balls. A good southern treat. So many much-loved desserts(too many) including German chocolate cake, red velvet anything, and Kaluha cheesecake. Thanks for the opportunity. My favorite dessert is chocolate mousse. 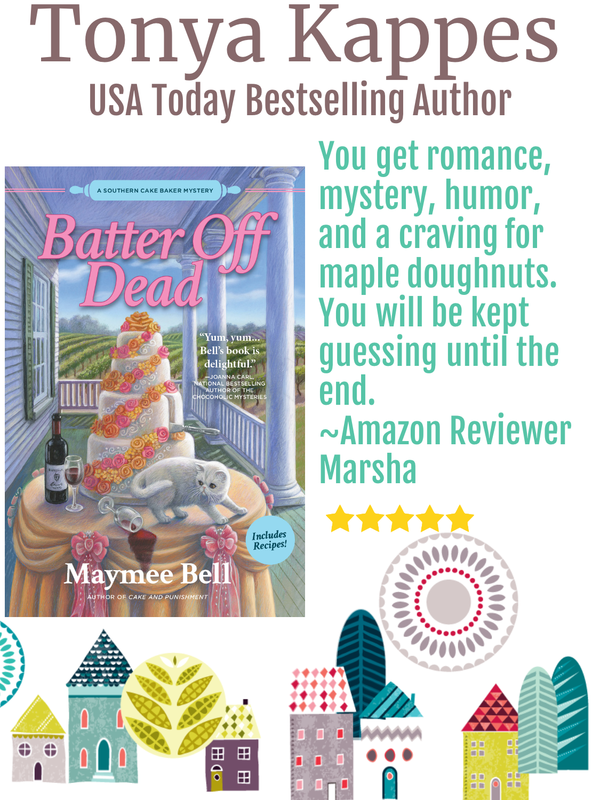 Love this series, looking forward to reading "Batter Off Dead". The cupcakes look amazing! I’m not a big fan of bananas but I would try this for sure but if I had to pick a favorite dessert it would be the chocolate mousse cheesecake that we can only get a restaurant in Lancaster, Pa. I’d love to try and duplicate that recipe. I love cheesecake, any kind! Thanks for the chance to win! Pumpkin cheesecake is my favorite! I love banana bread warm from the oven with butter on it. Coming in second would be microwaved for a few seconds with butter. Third would be soft brownies with just a tad bit of crunch on the edges. That cupcake sounds delish!! I would love the real recipe. I make a mean banana bread which I've made in a rectangluar pan as bars, but not cupcakes. My banana bread has chocolate chips and butterscotch chips to give it that extra contrast. Thanks for the chance. When I worked at Jackson Lake Lodge in the Grand Teton National Park they made the absolute best strawberry Cream pie. I think I finally found a recipe that is close. I love Tiramisu! Any coffee fanatic would know what that is. Its' name means "pick-me-up" in Italian. I do love a lemon cream cheesecake. 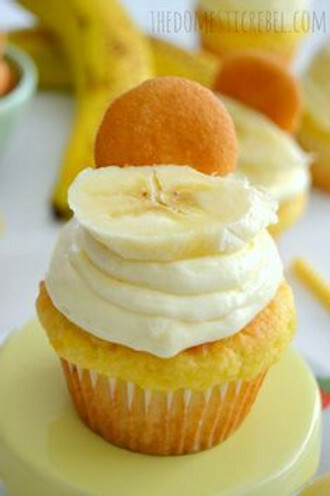 I love brownies, but the banana pudding cupcake sounds wonderful. Thank you for the opportunity. Goodness! Picking my favorite dessert for me would probably be like asking you to pick your favorite book. :) I've got to admit, banana pudding is one of my favorites & those banana pudding cupcakes look divine! Well my nickname is cookie monster so I would have to say that is my favourite but after that is anything with apples, apple pie, crumble etc. Brownies. Moist, fudgy, with slightly burnt edges. Yum! Or a waffle with a scoop of chocolate ice cream on top.In my world, chocolate is the only flavor, but it's OK to add PB to it. I haven't met a dessert I didn't love.